FRANKLIN, Mass. 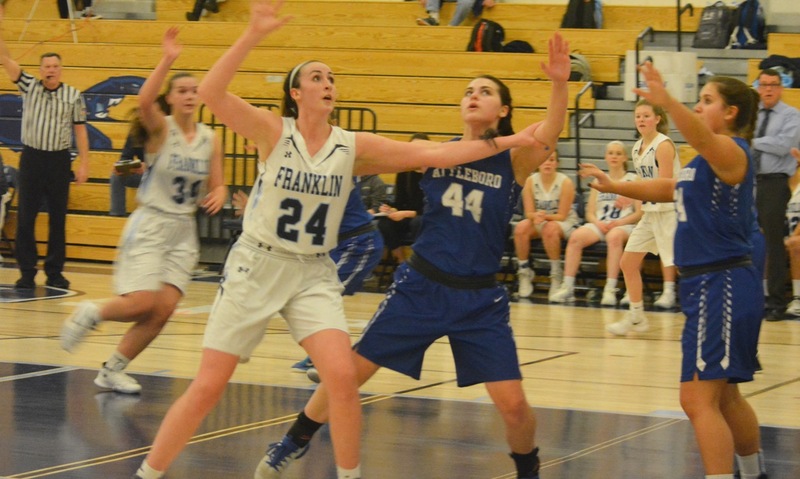 – During the first half, the Bombardiers had little answer for the dynamic inside-outside combination of Franklin sophomore center Ali Brigham and junior guard Bea Bondhus. The duo combined for 30 points before the break to push the Panthers to a 21-point halftime lead. Although Attleboro turned up the energy in the second half, particularly on the defensive side of the ball, the lead proved too great to overcome and Franklin stayed within one game of the Kelley-Rex division leaders with a 63-51 victory. Bondhus opened the paint by knocking down a pair of threes in the opening half and spreading the Attleboro defense out with 14 of her 18 points coming before the break. With the outside threat giving Brigham a little space with which to work, the sophomore showed off an array of offensive moves on the post and stepping away to face the basket. She scored 16 of her 22 points in the first half and also added 12 of her game-high 20 rebounds. Brigham was also a force on the defensive side with four blocks. Breanna Atwood got the game started for Franklin, which got right into its dribble-drive offense and full-court press. Atwood (10 points) buried a corner three and scored five points in the first. Then Brigham got going. She scored with a short jumper, an offensive rebound, and a jumper with a foot on the three-point line. The Panthers kept pressing and Bondhus nailed a corner three and got free for a layup off an inbound pass by Calen Frongillo. Franklin led 21-8 after the first and kept the offense rolling into the second. Attleboro cut the lead to eight with a transition layup from Nyah Thomas (six points) and a three by Sam Pierce, but then Brigham scored with a drive on the baseline and hit a floater. Bondhus followed with her second three of the half and the lead grew to 17. Brigham added six more points on a jumper, a hook shot going to her right and a put back bucket, while Bondhus got two when she cut to the basket and was found by Atwood and then got a steal and transition basket to put Franklin ahead 42-21 going into halftime. Coming out of the break, the Bombardiers played with a lot more energy. Junior guard Jordyn Lako provided a spark on the defensive end with two steals, two blocks, five assists, and eight rebounds. Attleboro also started to get the ball into the hands of Pierce, who would score 19 of her game-high 24 points in the second half. Attleboro trailed by 22 heading to the fourth, but the Bombardiers never let up. Pierce completed a traditional three-point play off a Lako assist, went 5-for-5 from the line, and scored 11 points in the fourth. Liv McCall buried a pair of threes and Attleboro got as close as 10 points in the final minutes. Despite a youthful lineup, Franklin trails Mansfield and Oliver Ames by only one game in the league standings and Leighton sees improvement from the start of the season. Franklin (7-4, 5-2) will put its four-game win streak on the line against King Philip on Friday, while Attleboro (5-6, 3-4) faces a trip to Taunton. ATTLEBORO, Mass. – Attleboro was clinging to a one-point lead heading into the fourth quarter of Sunday night’s game against King Philip, but the Bombardiers shut down the Warriors over the final eight minutes, allowing only six points and two made field goals from the visitors to pull away for a 52-41 victory. “I think this is our most complete effort, front to back, all year,” said first-year Attleboro coach Marty Crowley, who was facing KP for the first time since leaving the Warriors during the off-season. Attleboro scored the first five points of the fourth on drives to the basket by MacKenzie Roberts (her only basket of the game) and sophomore Nyah Thomas (seven points, six rebounds). Faith Roy scored on a drive and Shannon O’Connor hit a free throw to cut the lead to 41-38, but Abby Struminski added a pair at the line and Sam Pierce (14 points, eight rebounds, five blocks) scored in the paint to extend the advantage back to seven points. Pierce followed with a kick-out pass to junior Jordyn Lako for a three-pointer that pushed the lead to 11. Lako scored all 14 of her points in the second half and the point guard also chipped in with nine rebounds. After O’Connor knocked down a late three for KP, Thomas scored in transition and Lako got a steal and layup to seal the win. O’Connor, the Boston University-commit, started the game on fire, scoring 11 of her game-high 19 points in the first half, including nine in the first quarter. Crowley admitted that the Bombardiers had to change things up defensively to slow down the junior guard, who he had coached for the past two seasons. 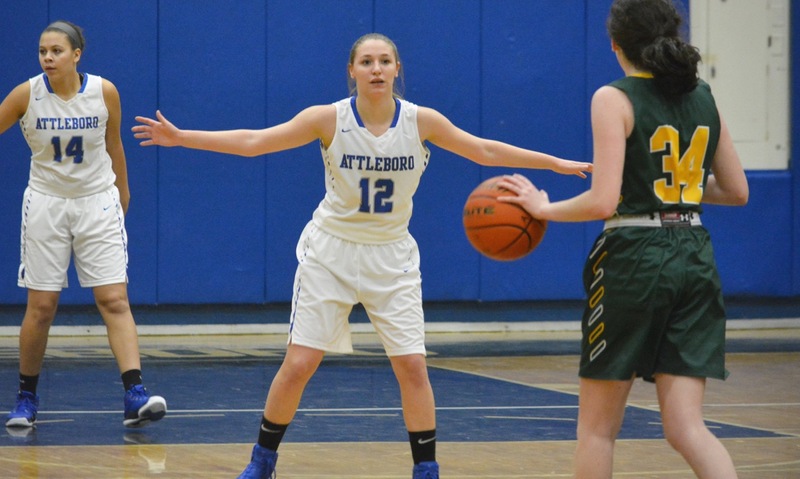 Pierce kept Attleboro in the game in the first quarter with seven points and Liv McCall gave Attleboro a much-needed perimeter threat with all nine of her points coming in the first half (on three shot from beyond the arc). The Warriors were also forced to play without starting forward Faye Veilleux for the majority of the game after the sophomore twisted an ankle in the first quarter. The teams went into halftime tied at 25 apiece and the third quarter was back-and-forth. Julia Leroux (nine points, six rebounds) gave KP a brief lead and O’Connor scored four points in the quarter to tie the game at 31-31. Leroux added a pair from the line to give the Warriors a lead at 33-32. Christina Hathaway scored inside to put KP ahead by three points, but the Bombardiers rallied behind Lako, who scored eight of the team’s 11 points in the third. She buried a three off a Rory Hopkins pass to tie the gam and added a free throw to give Attleboro a slim edge heading to the fourth quarter. For almost seven minutes of the fourth quarter, Attleboro held KP to just three points, pushing the lead and securing a third league win in four games this season. Attleboro (5-3, 3-1) will travel to Mansfield on Wednesday just one back in the win column of the Hornets in the Kelley-Rex standings. King Philip (2-4, 1-3) will host Oliver Ames looking to get back on track. Attleboro High School announced Marty Crowley as its new girls basketball coach on Tuesday morning. 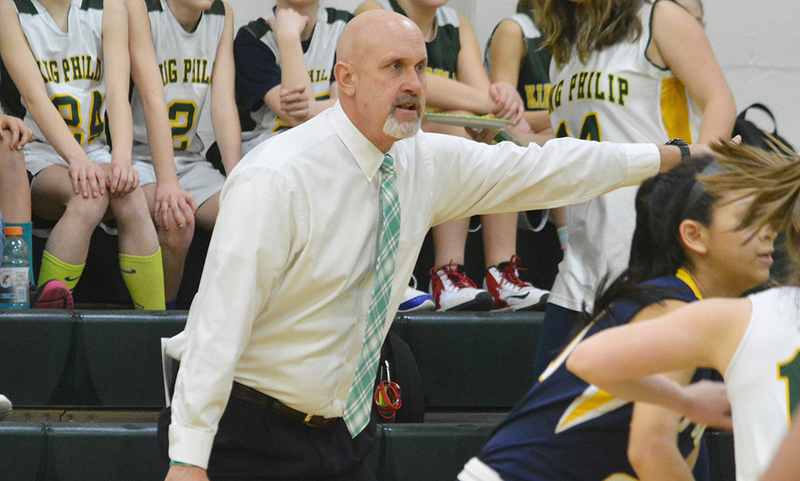 Crowley, who spent four years as the girls basketball coach at King Philip, takes over for Rick Patch who stepped down in May. Crowley takes over a program that posted an impressive 16-8 record last season and finished third in the Kelley-Rex division. The Bombardiers have reached the postseason five straight seasons. During his four years patrolling the bench at King Philip, Crowley helped the Warriors to 33 wins and a playoff appearance in 2014. TAUNTON, Mass. – After scoring just three points in the second quarter and nine points in the first half, King Philip needed someone to provide an offensive spark and give the Warriors a lift to try and erase a 12-point deficit. 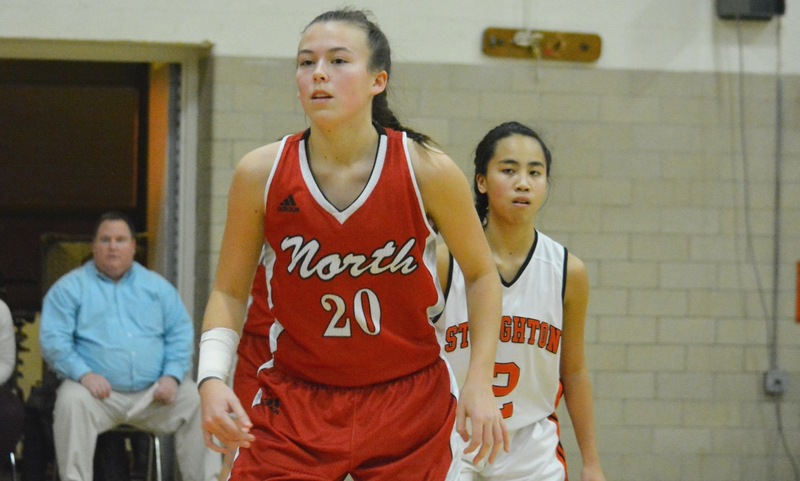 In the second half, senior guard Jen Lacroix gave KP the boost it needed, scoring all 12 of her points after the break and the Warriors pressure defense forced 19 second half turnovers to turn the deficit into a one-point win on Friday night at Taunton. 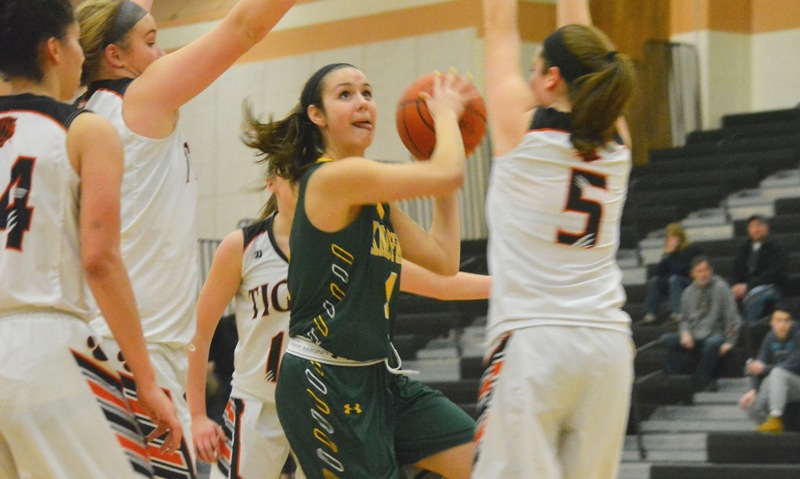 The Tigers had a lot of success in the first half running the offense through senior forward Alyssa Gibson, who scored seven of Taunton’s nine first quarter points and finished with a game-high 13. She was able to drive through the lane as well as score on offensive rebounds (14 boards on the night). Wade and Lily Patneaude each knocked down threes in the second, as KP sank into the lane to protect against Gibson’s offense, although the forward added another four points in the quarter. Meanwhile, KP managed only two made field goals in the entire first half – one each for Shannon O’Connor and Sam Madden (eight points). Lacroix knocked a jumper, which was answered by Mackenzie Handrahan, then she hit another shot off an assist by Maddie Purdue, but that was also answered by a drive from Maggie Sullivan, as Taunton kept the lead at 12. After a pair of free throws from Gibson made the score 27-15, KP closed the quarter on an 11-0 run to cut the lead to just a single point. Madden scored on a layup following a Lacroix steal, Lacroix buried a jumper, Riley Dalzell drove to the basket for a layup and O’Connor scored off a steal, as the Warriors used their defense to create offense. The Warriors also started to crash the boards as a team. Although Gibson would lead all players with 14 boards, Dalzell (10 rebounds), Christina Hathaway, and Hadley Zolak all contributed on the glass for KP. Taunton scored the opening four points of the fourth quarter, Wade and Kia Pate each getting baskets, to extend the lead back to five but then KP took control with a 10-0 run into the final 10 seconds of the game. Again it was Lacroix with the big shot, as she buried a three that stemmed the tide and cut the lead to two. Riley Dalzell made a pair of free throws that put KP ahead 32-31, its first lead of the game, and then Lacroix knocked down a jumper following an O’Connor steal and Dalzell found Hathaway for a layup that put the Warriors ahead 36-31. Patneaude (11 points) hit a three that made it a two-point game, but O’Connor stepped up to the line and made both free throws to ice it. Patneaude hit another from deep at the buzzer but it was not enough. Taunton (3016, 2-14) will close out its season on Monday against New Bedford. King Philip (6-13, 4-12) wraps up its campaign at Lowell on Wednesday.